Bush pilots are, to put it mildly, an opinionated breed, so it is not unexpected to find that strong preferences exist in a profession that utilizes three different types of landing gear. Some pilots love floats, and feel the only true bush planes are those that operate from water. 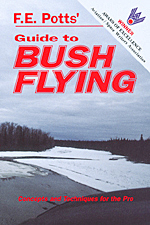 Others like skis, feeling that only with them is the epitome of northern bush flying truly manifested. I must confess to being a trifle stodgy -- I prefer wheels. Much of the basis behind these choices lies in the realm of personality and psychology. For example, I enjoy precision in flying over all else, and this is best realized on wheels using very short strips. Some gravel bars, especially those used for hunting, are so critical in respect to length that the margin for error is in the neighborhood of ten feet. Yet, how can you obtain the skills necessary to operate on these marginal strips? And, what can you do to hurry the learning process? Well, starting with the time element, the unfortunate truth of the matter is that these skills can only be developed over a period that spans not days or weeks but many seasons. The mind is capable of grasping ideas fairly quickly, but it takes time for the skills to filter down to a deep enough level in the subconscious that proficiency finally becomes solid and ingrained. While I was forced to master the basics of off-airport operations quickly, since a rough 500-foot gravel bar in front of my cabin was all I had for an airstrip, this is not the optimum way to learn this skill. Far better to work up to serious short field operations slowly. So, I am going to provide a few exercises in this part of the book that might help you learn the trade a bit more safely, if not more rapidly. Becoming really proficient at anything requires an enormous amount of dedication, combined with work and study and time. The most productive attitude you can take towards this situation is to acknowledge that it is a career-long project that produces a new bit of information or insight on almost every flight. It is a process of ever-increasing refinement of detail, of learning how to recognize and remaining ahead of all the various trends that develop. Perhaps this is one of the reasons I continue, even after all these years, to find flying so fascinating.